All yoga instructors of the studio are experienced practitioners of Kriya Yoga, the branch of yoga that studies the human nature and the hidden opportunities within. The basic knowledge has been acquired from Lilleoru Self Awareness Training Centre, the official Kriya Yoga centre in Estonia. This base enables to perceive the world through deep yogic prism, which is the thin red line linking all the courses and classes in the studio. Please click 'schedule' to see the list of the classes and workshops (mainly in Estonian) in one of the main physical studios in Tallinn City Centre! During the January and February 2016 our schedules and menues on this web page will be developed - we are sorry for changes you may meet during this time! essence: the conscious growth of a human being. almost anyone. What is the key to the “fountain of youth”? these exercises will help you rediscover a new freshness. With just ten minutes, you will soon discover that you manage to get more things done and enjoy your day so much more. Anne-Ly Naukas, a teacher of kriya hatha yoga, demonstrates the exercises and provides many additional tips. Babaji kriya yoga acharya Ingvar Villido Ishwarananda describes the benefits and effects of Five Tibetans in his short introduction to the DVD. Thoughts and feelings are closely connected to breathing: once you balance your breathing, emotions too will fade and thoughts become calm. Matreyka pranayama is a simple technique for mastering your breathing. Love and respect yourself: this is easier said than done, so can you achieve it? Yoga technique, introduced by the Babaji kriya yoga acharya, Ingvar Villido, will help you get there. By resolving the tensions within yourself, you may discover that your relations with the people around you will also change. Change yourself – and the world around you will change. DVD is available with English, Estonian and Russian cover and inlet. (Look closer by klicking the picture above.) The content of all DVD-s is in all three languages. One can buy the DVD from 'Studio108' or bookstores. Introduction: What are “the five Tibetans?” by Babaji Kriya Yoga acharya Ingvar Villido Ishwarananda. 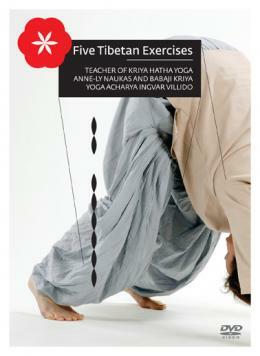 Fifth exercise, kriya hatha yoga teacher Anne-Ly Naukas.